Industrial process control is normally achieved by manipulating operating temperatures, pressures, levels and flow rates, with the aim being to produce an end product of proven quality while optimising the operation so as to minimise the production cost. Quality control is generally achieved by using analysis of samples that have been drawn from the plant and transported to a laboratory. In many industries the use of a relatively remote laboratory to test the samples takes too long for the plant to be optimised when there are possible changes in feedstock or other external factors. Automated process stream analysers may be used to inform operators of quality changes, and ideally to provide an advanced control layer and improve efficiency. 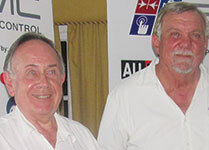 From l: John Owen Ellis; Hennie Prinsloo. 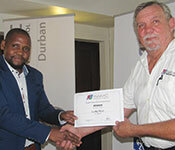 The talk presented by Hennie Prinsloo and John Owen-Ellis to the SAIMC Durban Branch on the 6th March 2019 provided an introduction to what is required to design a complete analytical system. It started with an overview of the large quantity of information that is needed, and then took the audience through sample extraction from the process, sample conditioning to suit the analyser, and finally sample return to the process or other safe disposal point. Emphasis was placed on the need for compiling comprehensive and up-to-date information about the process fluid and potential contaminants so that a complete analytical system can be designed and implemented. The talk concluded by demonstrating the information and design aspects of an on-line analyser that measures the amount of sulphur in diesel fuel, and which has been operating successfully for several years. The meeting concluded with networking over a meal to the usual high standard of the Durban Country Club.